What Do You Say to Future Island Leaders? The birthday party for the 25th anniversary is over. It was celebrated on Pohnpei for nearly the full week after Easter. Photos have been posted, good wishes exchanged, and the convocation and gala dinner are a happy memory now. All that remains now is to move forward step by step to achieve the dreams that were shared at the birthday celebration. When we were kids, we would sometimes find ourselves standing at the door of the church in the evening and peering inside. The church looked like a large, gloomy cavern. If we entered, we found ourselves stumbling over pews and often startled by large statues we didn’t know were there. 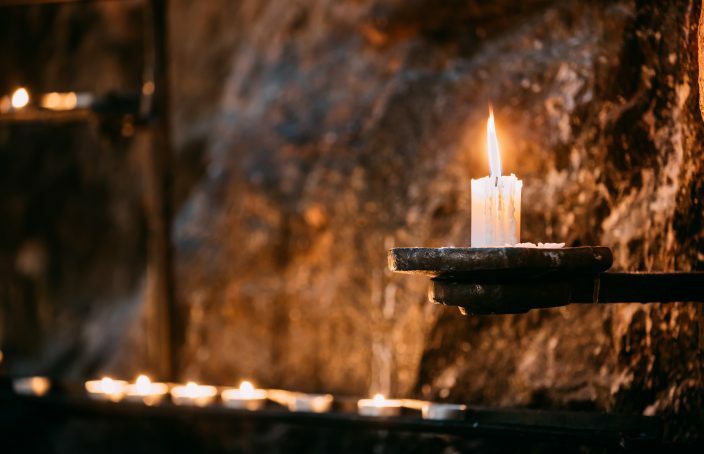 Once in a while, we would be taken by surprise when we heard a snuffle or a wheeze–a signal that someone was praying in one of the pews. The church at night was a spooky place for us kids. The one familiar landmark, I remember, was the flicker of the distant sanctuary lamp in the front of the church. Participants of the Executive Leadership Development Program in Guam. How often do you get a chance to spend a morning with thirty-some bright young islanders, many of them holding good government positions and destined to hold more important posts in the future? 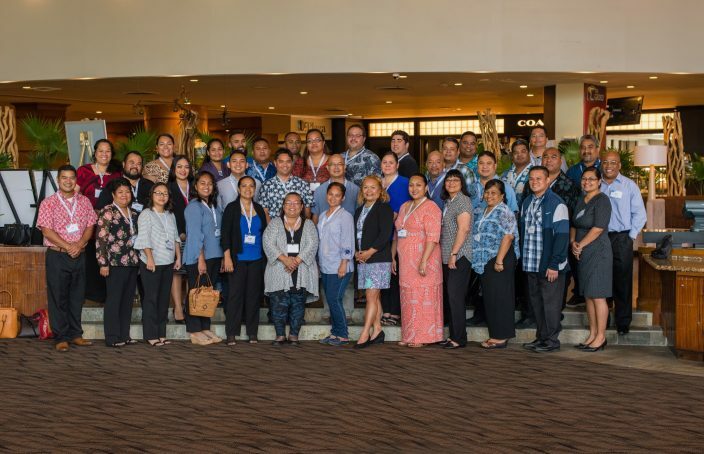 They are island leaders in the making–and the program held for them this past week on Guam was termed the Executive Leadership Development Program. 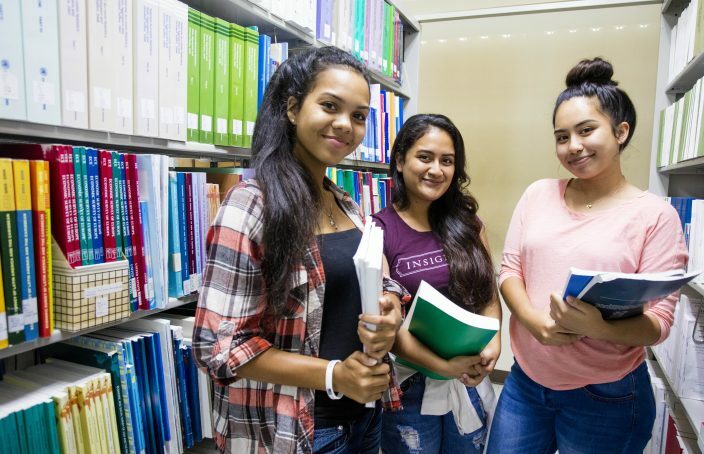 These young people gathered from six different governments, including the various parts of Micronesia and American Samoa. Biship Julio, pictured with some of the deacons who attended the ceremony. On Sunday, February 4, Fr. 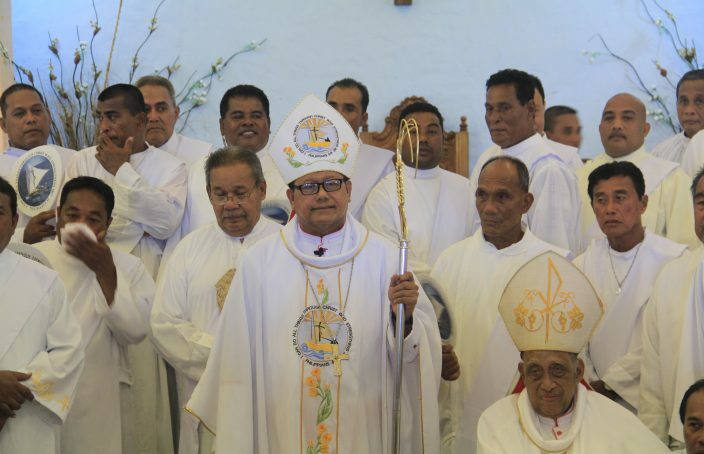 Julio Angkel was given his episcopal ring along with his crozier and mitre in a two-hour ceremony held in the cathedral on Weno, Chuuk. He has been appointed assistant to Bishop Amando at this time and replacement for him when he retires. 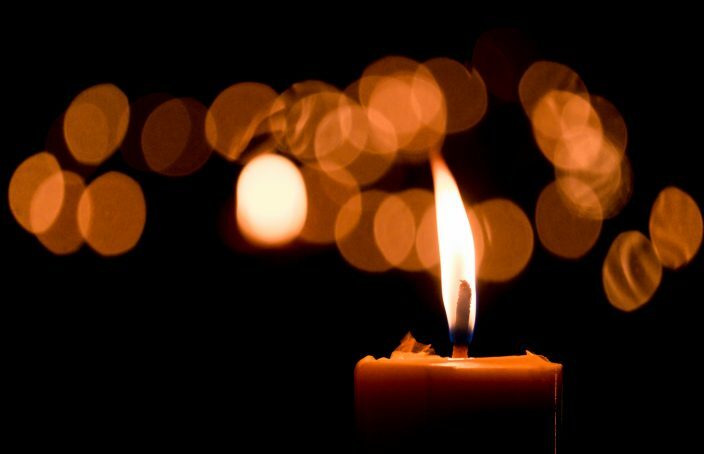 The other night when I was invited to lead prayers at a Chuukese wake, I thought I knew what to expect. First of all, the viewing was not for a single person, but for two young men–first cousins, as it happens, who died violent deaths. The two youths, one of them just 18 and the other in his early 20s, died of gunshot wounds to the head, after another young man, who was hit in the face with a slingshot, caught up with them and killed them both. Who started the trouble? The shooter said that one of the Chuukese did. Who knows? Maybe the court will clarify all this in the course of time. But that evening my job was not to determine responsibility for the crime; it was to comfort the families of these two young men. 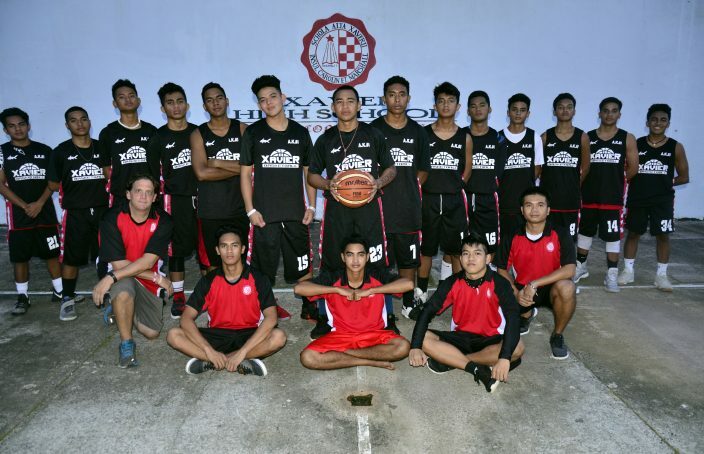 The Xavier Navigators are fundraising to travel to Pohnpei for a high school tournament. When I first arrived at Xavier in 1963 to begin teaching, basketball was all but unknown in the islands. Baseball was the sport of that era, dating back to the Japanese administration before the war. 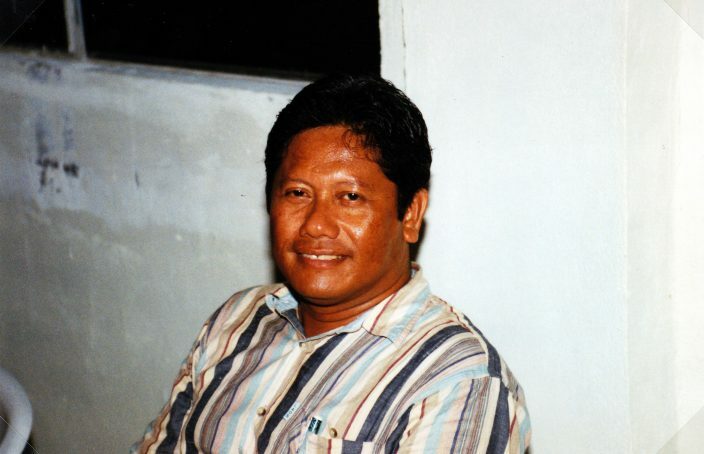 By the end of my first year, the Xavier team had uniforms and were playing the Filipino workers around the island. The next year they were playing Truk High School, which also had put together a team. Basketball in Chuuk was on its way to becoming the popular sport it is today. 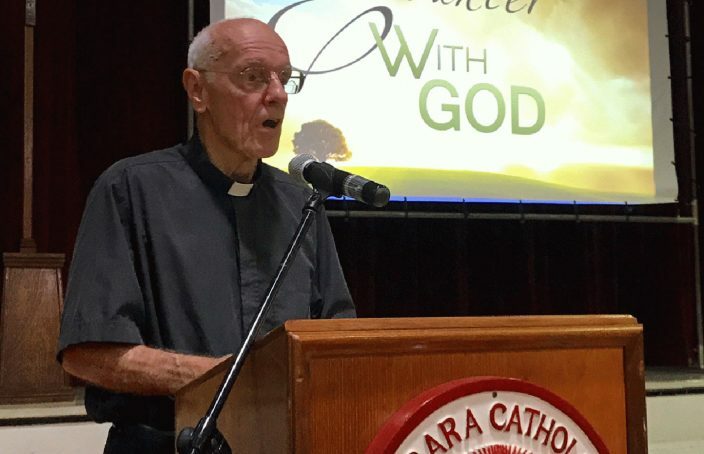 Julio Ankel, the new Coadjutor Bishop of the Caroline Islands. On November 18, Rome announced the appointment of a coadjutor bishop with the right of succession. In lay terms, that means a bishop to assist the current head of the diocese, Amando Samo, and to succeed him when he retires.